Al Pie de la Cruz monastery was founded in 1597 by nuns who came from the Servite Monastery in Sagunto, founded in its turn on the charism of the Order of the Servants of Mary, a thirteenth century mendicant Order founded by the Seven Holy Founders and whose female branch has Saint Juliana Falconieri as their inspiration and spiritual mother. 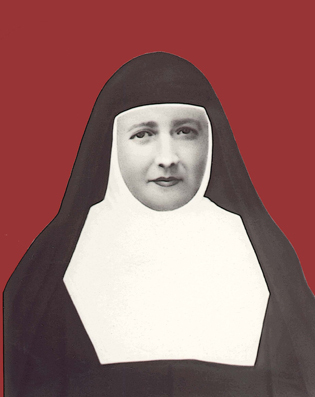 It was on her feast-day, 19th June 1900 that Maria Ricart Olmos made her solemn profession of vows, taking the name of Sister Maria Guadalupe. Enamoured of the charism of the Order, she based her whole life on its characteristic aspects: fraternal charity and unity, contemplative prayer and humble service, love and devotion towards Our Lady of Sorrows, in whose honour she fervently recited the Rosary of the Seven Sorrows as she identified herself with the sufferings of the Virgin Mary. As she contemplated the Passion of Jesus and meditated on the sufferings of his Mother at the foot of the cross, she always sought recollection and practised corporal penance. With her jovial character, deep spirituality and leadership abilities, she accepted the office of Mistress of Novices in the period 1928 – 1931. Afterwards, she held the office of Prioress during the difficult dark years 1931 – 1934. She was then re-elected Mistress of Novices and held that office until her martyrdom, passing on her most important lessons to her sisters.